Range Rover P38. AES,V8 computer controlled and complex. I wanted a reliable,simple and economical vehicle.Instead,I bought a 4.0 litre petrol Range Rover P38. Changing the front air bags,repairs to the air suspension and other jobs. The P38 range rover uses a electronic control unit to operate its electronic air suspension system (AES) this has to be reset after a failure or after any repairs. Every time the ignition is turned on the system checks for faults,a serious failure can lower the vehicle on to the bump stops,the pump turns off and a warning message limiting speed is shown on the dashboard. Although the reset can be done by a Land Rover dealer or some other workshops equipped with the necessary equipment it is possible to do the job with a lap top,a special cable and commercially available soft ware. It is also possible to do the same thing with jumper wires although this is considerably more difficult. I have found that sometimes simply leaving it alone for ten minutes or so will clear faults. These vehicles are also very prone to display faults if the battery isn't holding a decent charge. Changing the front air springs is an easy job needing just two spanners,a screwdriver and pliers plus jacks,axle stands and some wood blocks. My P38 range rover was suffering from a common problem.Over a few days the suspension would settle,eventually getting so that leaving it any length of time would result in the car lowering itself down to the bump stops. The vehicle would raise,over time this took longer and longer and soon it got to the point where the vehicle could almost be watched going down at one corner. Spraying the pipes and bags with soapy water revealed a leak (just above the bolt head in the picture) The leak was not contstanr sometimes raising the vehicle made things worse and sometimes it would almost seem to stabilise this was a result of the rubber flexing making the leak vary. The vehicle was jacked up using jacks,and axle stands with heavy baulks of timber until it was approx at the height it would be when on its maximum height setting. A door was left open to stop the AES self levelling mechanism from cutting in,the tailgate was also left open just in case someone shut the door.The wheels were removed with jacks lifting the front axle slightly. It is possible to access the springs,clips and pipes with the wheels on and the plastic wheel arch liners in place but these were removed. They covers are held by cheap plastic clips that break and distort easily,new ones cost pence and are much easier to fit. With the shield off access is so much easier. The spring on this side has already been removed,with the wheel and shield removed it takes ony a couple of minutes. Check there is no air pressure left in the bag by squeezing ,if it feels firm drain air either by using a computer/AES device or by undoing the drain valve on the tank a half turn. Then using the jaws of a small spanner or adjustable set to slide easily over the air lines press down the collet on top of the air bag turret and pull out the pipe. There are two pins at the top of the air bags they poke up through the support and each has the clip illustrated to hold it in position. With the body supported on jacks and no air in the bags it should be possble to move them slightly. A fairly wide bladed screwdrive can be used to lift the clip until the top clears the pin ,the clip can then be pushed forward and removed. New clips only cost a few pence. The top and bottom of the original springs and the replacements are made of a dense plastic.Although some are I believe alloy,the plastic is obviously up to the job. A 13mm headed bolt is screwed into the plate on which the bottom of the bag rests,towards the centre of the vehicle and close to the outer rim of the bag. (See picture there is a notch in the bottom close to where the bolt is found) This bolt is removed,it holds a stiff piece of wire that goes under the notch in the plastic and under the plate through a hole in the base to secure it. The pin is simply wiggled out pulled towards the vehicle centre line. Replacement is simply a reversal of removal.The bags are inserted the clips fitted and the air lines pushed in carefully. With mine I started the engine with the doors and tailgate shut watching as the bags inflated.When they had gone hard with air pressure I replaced the wheels which with the axle jacked up were only just clear of the ground,I carefully removed the jacks and axle stands in a few stages and then allowed to suspension to raise to its correct height. This is one of the air bags removed from the front. Unless the suspension was raised to its top setting most of this damage was unseen. The bags are original land rover parts, I used Dunlop made replacements on mine. When finished the range rover sits nice and proud,even after a week or more it hasn't dropped a mm. Changing the the fresh air intake filter. At the base of the windscreen is a panel with a foam filter held underneath that admits air for the heater etc. This foam breaks up and bits fall into the air inlet along with leaves etc. Three screws under the rubber hold the windscreen side trims,the windscreen bottom trim can then be slid out with one trim lifted away. 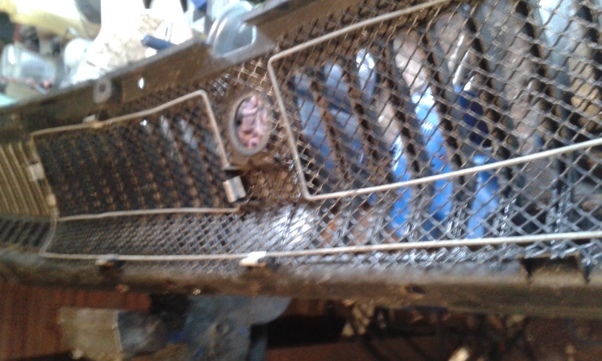 Screws (that are normally rusted) hold the panel,which is here seen laid on the engine. I replaced the rotten foam with a fine mesh semi rigid plastic grid.It stops leaves and twigs getting into the intake.It is held by the original clips,the range rover filter seems over priced for what is simply a piece of thin foam very much like that used as a filter in ponds etc.